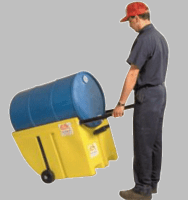 A Drum Handler can make your job easier in lots of ways. Drum Size and Type is the first factor. All of the Drum Handlers will accept steel drums, and some will also accept plastic and fiber drums, too. Other models require an adapter or special saddle. Saddle Type follows from the drum type. The simplest is a saddle with a chain or belt fastening. For fiber and plastic drums, a wrap-around saddle is better, or a model with rubber-lined gripping jaws. Lifting/Dumping Height is the next thing to think about. Models are available that lift and dump at up to 96� from the floor, or more on special order. Make sure you have enough headroom to lift that high. Higher lift height units use a chain wheel to control the drain angle. Work Area is an often-overlooked detail. In close quarters, you might need a Handler with closely spaced legs, or one that drains off to the side, rather than straight ahead. Hazardous areas call for saddles and cinch chains made of non-sparking materials. BayTec has the best trained and most knowledgeable customer service people in the business. They�ll help you figure out the equipment you need to get the job done right. When you need a Drum Handler, get it Right ... get it from BayTec! We carry many types of Drum Handlers. Please Call for other Styles and Applications.